Whether it's your home or your garden, pests and rodents are a nuisance and potential hazard. Electronic pest control is a safer and viable alternative to chemical pest control sprays. Electronic pest control is easy to use and environmentally safe. You do not have to deal with dead carcasses of rodents or inhale obnoxious fumes of chemical pest control devices. Electronic pest control devices range from bird repellers and fly trapping systems to rodent control devices and animal repellers. This article takes a look at the technology behind the Pest control. Though the technology for these devices has been on the scene for the last couple of decades, with the advent of more advanced custom designed chips available at reasonable prices, these devices have evinced interest in the general usage. Find out whether these products really live up to their claim. There is no dearth of electronic pest control devices, be it electric fences, ultrasonic noisemakers or motion detecting water sprayers. Electronic repellers for animals and birds are designed to emit sounds that scare away or confuse pests. Some are audible to humans while others are not. Sonic pest repellers emit a sound that we can hear while ultrasonic pest repellers are silent to humans and some animals. Ultrasonic pest control devices emit high frequency, short length waves that cannot be heard by humans. Humans can hear from about 20 Hz to about 20kHz depending upon factors like age. As we grow older, we lose out on the higher frequencies. Animals on the other hand can hear much higher frequencies than us and we can adopt such high frequencies to dispel obnoxious animals from the protected area. This technique is widely used to repel animals such as dogs, bats and rodents. Loud modulated high frequency noise can frighten and induce distress in most animals. Since ultrasonic pest control devices use variable pulse generators, the pests are unable to get accustomed to it. Electromagnetic pest control devices work at repelling rodents by creating an electromagnetic field of your household wiring. Electromagnetic Pest Control utilizes your wiring by sending a shifting signal through the wire, tuned to irritate the nervous system of pests. This technology will not affect humans, pets or electronics. This confuses them and makes it impossible for rodents to gather food, breed and build their nests or communicate with each other. Besides Electro magnetic pest control devices induce different frequencies modulated on the mains signal ( 60 Hz in the US or 50 Hz elsewhere) with sufficient amplitude to penetrate walls and evict the pests hidden in crevices. You can pick up specific electronic pest control devices to tackle moles, squirrels, mice and rodents. The pest control device for biting insects produces scent that is not suitable for insects but is pleasant to humans. It sprays scented repellant with essential oils. Ultraviolet fly zappers trap insects and flies. Electronic pest control device for rodents such as rats and moles and gophers can help protect your garden. Bury a device that emits penetrating sonic pulses of 300Hz at 15-second intervals and you can keep your lawn and garden pest free. These devices work on auto changing, high intensity frequencies and pulse sequences. They attack the auditory and nervous system of the pests. There are pest control electronic devices that work on recognizing the smell of termites. This allows you to take action as soon as they are spotted. Some pest control devices work as listening devices and have ultra sensitive microphones and amplifiers to allow the electronic pest control professionals to detect the presence of rodents and other pests such as scorpions, fleas, cockroaches and lice. Equipment of this kind works well for basements, attics and storage spaces. Ionic technology is used in certain electronic pest control devices. The beneficial negative ions created by these devices destroy dust mites, bacteria and harmful airborne pollutants. Since pests are sensitive to negative ions, they seek shelter far away and look for food elsewhere. Since most electronic pest control devices work at repelling pests, they are less messy. 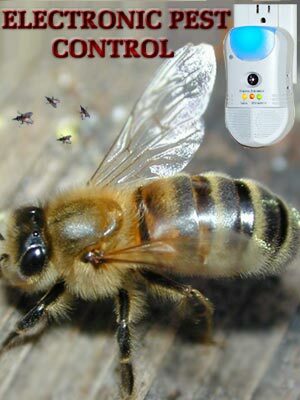 The degree of repellence of an electronic pest control device depends on the frequency and intensity of the emission and equally on the pest infestation. Many a time the rodents are temporarily repelled from the immediate area of the ultrasonic pest control device but they return later. However, there have been many disgruntled customers who insist that these electronic pest control devices do not effectively repel or eliminate pests from the home or commercial space. The FDA has also been warning consumers about verifying the tall claims made by some electronic pest control devices. Most of the devices emit high intensity ultrasonic sound and although these high frequencies are highly directional, they can still cause distress to your pets. These ultrasonic waves do not penetrate walls and glass panes. So careful siting of the devices may be prudent to cause unwanted reaction from your pets or from your neighbors. Again these sound waves, though inaudible to most humans, are perfectly capable of being heard loud and clear by microphones and other electronic devices. So the distortion you hear in some pockets of the house when speaking over the phone may be due to your pest control device. They can cause squelching ( or muting) in some hearing aides too. If you house is protected by a burglar alarm device which uses any ultrasonic device for intruder detection might be confused by your electronic pest control device. First Published Date: Mar 28 2005 Last modified Date: April 18 2019 This page may have been updated recently as new information is available or the content may have been edited for better readability.